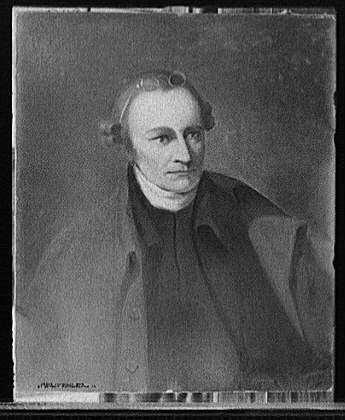 Patrick Henry was born on May 29, 1736, in Studley, Virginia. He was a brilliant orator and an influential leader in the opposition to British government. As a young lawyer, he astonished his courtroom audience in 1763 with an eloquent defense based on the doctrine of natural rights—the political theory that man is born with certain inalienable rights. On his twenty-ninth birthday, as a new member of Virginia's House of Burgesses, Henry presented a series of resolutions—the Stamp Act Resolves—which opposed Britain's Stamp Act. The Resolves were adopted on May 30, 1765. He concluded his introduction of the Resolves with the fiery words "Caesar had his Brutus, Charles the First his Cromwell, and George the Third—" when, it is reported, voices cried out, "Treason! treason!" He continued, "—and George the Third may profit by their example! If this be treason make the most of it." 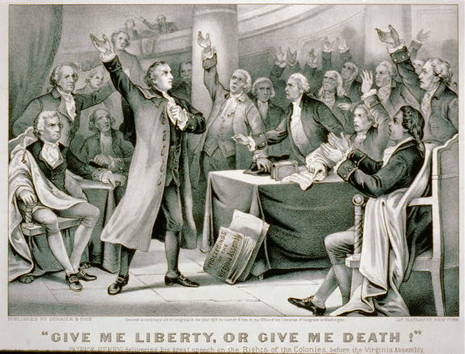 Patrick Henry (May 29, 1736 – June 6, 1799) was a prominent figure in the American Revolution, known and remembered for his "Give me Liberty, or give me Death!" speech, and one of the Founding Fathers of the United States. Along with Samuel Adams and Thomas Paine, he is remembered as one of the most influential (and radical) advocates of the American Revolution and republicanism, especially in his denunciations of corruption in government officials and his defense of historic rights. but there is no peace. The war is actually begun!